The provision of food requirements for current and future generations can be guaranteed through agricultural intensification options that safeguard the production resource base. Over the years, the debate on sustainable agricultural intensification has not been matched with due regard to how the intensification options influence the functions and balance of soil organisms and soil biology in general. Soil mesofauna and microorganisms have received very little attention so far. 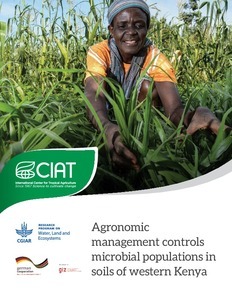 In sub-Saharan Africa (SSA) especially, there is very little knowledge and documentation of soil micro-organismal functioning and how these affect and are affected by the abiotic environment (soil physical and chemical properties, and climatic conditions), as well as agricultural management and intensification. Therefore, there is need to evaluate how measures to restore soil fertility and improve its productivity influence not only crop productivity and soil physical and chemical changes, but also soil biology, i.e. the diversity of macro-, meso- and micro-fauna and flora. In addition, the impact of ‘sustainable’ intensification on the evolution of greenhouse gas (GHG) emissions and related climate footprint remains to be assessed in a comprehensive manner. Key intensification options currently under promotion by practitioners include conservation agriculture and various integrated soil fertility management (ISFM) options. Minimum soil disturbance, a minimum soil cover of at least 30% throughout the season and crop rotation/intercropping, all of which are principles of conservation agriculture (CA), have been shown to not only introduce shifts in microbial populations but also improve soil structure (Kihara et al., 2012) and enhance carbon sequestration in the top soil. On the other hand, increased aggregation in CA provides anaerobic microsites suitable for micro-organisms that contribute to nitrogen (N) losses through denitrification, and the release of nitrous oxide (N2O); a potent GHG. How such losses are influenced by nutrient inputs, such as through application of mineral fertilizer or biological N fixation, remains largely un-assessed in SSA. The use of chemical fertilizers, one way of increasing crop productivity in SSA, can have variable effects on microbial biomass and activity (Wardle, 1992; Treseder, 2008). For instance, increased amounts of readily available forms of key inorganic mineral nutrients, e.g. N and P, can decrease population and diversity of various microbial functional groups associated with nutrient uptake (e.g. arbuscular mycorrhizae fungi) and nitrogen fixation (e.g. rhizobium) (Azcón-Aguilar and Bago, 1994; Smith and Read, 1997). On the other hand, fertilizer use increases plant biomass production which, when returned to the soil, promotes microbial proliferation and diversity (Álvarez, 2005). The effects of fertilizer use, either alone or in combination of organic resources, on soil micro-organisms need, therefore, to be evaluated in order to guide sound soil management practices.